Hello dear dear friends... I am scrapping today. I tried stamping the title but didn't care for it. I switched colors & I love it. I am starting that right now. It is the heritage challenge one. I am so glad I love it now. You guys are right... they do fall through lots of times so I know that may happen. I did find 2 more that are similar to that one. WE will look at those. I also have more to look at. My first job for the day is to get my flat stamps organized. I had separated the flats from the handles and put the flats into a good-sized container...then my order from sb came with another 15 or 20 stamps, so it's time to organize. Hubby crawled under a desk and found a box of old photo albums. For now I'll use one of them and get my stamps half-way organized. I may do something different later, but for now I will at least be able to see what I have...and use them! I hope to work on a LO to finish up the Tahoe trip I'm currently working on. Another sb order is coming by UPS today, so I'll get my exercise running to the door every time I hear the rumble of a truck outside. Anticipation! Hopefully you'll soon hear some good house-hunting news, Linda. You've had enough of the bad news! Hi Judy, you are so right about using them so much more when organized. I am glad your dh found something you could use for now. Congrats on your new stamps & goodies. I think you should order everyday. You know you are supposed to exercise daily. Enjoy the new purchase & opening them. Have fun on date night. I think date night is a wonderful thing to do. I hope you two enjoy it. I hope you are able to finish the tahoe page. crossing my fingers for you, Linda!!!!! I got scrappy goodies in the mail today! 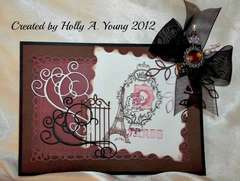 A new set of Paris themed stamps from Justrite, and FIVE new dies from Memory Box and My Favorite Things! I've been inky all day! Dear Holly, this is magnifgicent. You are a true card artist. I'm working on Christmas cards this week. I usually send out about 30 of them so I have to start making them early. I usually make up at least 4 of each design to speed up the process a little. Hi Lisa, Glad you are joining us. I am glad you are working on your cards already. I make over 30 too. I have been known to have them done in July. I had a friend who we had our Xmas cards crop in July every yr & played xmas music too. I haven't done that for yrs. In fact you make me realize that I do not have any idea for mine yet. lol Great you are here too. I'm going to go back and try to catch up on what's going on with everyone but I wanted to say Hi! I just made dinner so I am now back to finish this page. Hehe yeah I know, I need to work on them. Still haven't started a new page, but I was rooting around in my stash and found this key that I forgot I had. I felt the need to add it to one of my pages that I'd previously marked "finished" so I went back and added that. Do you guys ever do that? Finish a page and then a week or month or more later you decide you want to add something, stickle something, or mist something on there? I feel like I do that all the time. I have now stamped & torn my title so now I have to see what color ink I want to do them with. Hey Judy, did you & your dh have a fun date night last night? Date Night was great except Panda Express didn't give us our fortune cookies or sweet/sour sauce. Hubby will get doubles next week lol I managed to stay awake for the movie, but I was never sure who were the bad guys and who were the good guys. I know Jack Sparrow and the English were obvious with the uniforms. I hate movies that are so darkly lit. I can't distinguish faces well enough. But we look forward to some together time. Judy, we are the same way. Of course, I eat out all the time for work so when I come home on the weekends, the last thing I want to do is go sit at a restaurant, wait forever, have mediocre service, AND have to wear a bra! Give me Netflix, some yummy food, and my PJs and that's my idea of a perfect date. Okay so I ALMOST made a page. Got everything laid out, ready to glue down, and decided I didn't like it AT all. So it's back to the drawing board. I did do a little cutting and gluing with some rhinestones and a few paper layers, but I love the way that turned out and I can't wait to use it on a future page. It just wasn't right for the kissing photo and the KISS letters I want to use. I'm gonna go watch Interview with the Vampire with Rob and call it a night. Hopefully tomorrow my mojo will show up. Night all! Good afternoon everyone. I have my page on the table so I can see if I like it. I am adding stuff to it to see what looks good. I haven't chosen inking color yet. I do want to finish it today since I wasn't sure last night what I wanted. I FINALLY FINISHED MY SON'S FIRST BIRTHDAY ALBUM!!!! WHOOT WHOOT!! Yay for me! I went to a crop yesterday, from 5:30 until 8:30 (it was an all-day crop but I had a soccer game then work till 5). My goal was 3 pages, I generally do 1 page per hour. Not only did I do the 3 pages, but they were the last ones for the album, I finished the embellies for other pages, and bound them this morning!!! I feel great! I have only been scrapping for a year, so in that time I have completed the second six months of my sons life, up to his b-day party. The first six month pics were put in a regular photo album, then I lost the memory stick for a while. I just found the mem stick and printed the pics again, and they will be my next project. Time to use all the baby boy paper and stickers, etc that I have been collecting/hoarding! 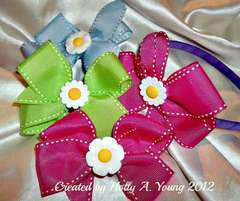 But since pinks and brights are my fave colors to scrap with, there will prob be a lot of unusual baby-boy-themed pages! I borrowed a cricut and used the paper dolls cart for some of the pirate die cuts, that got me out of my slump and finished with the project! Check out my gallery, peeps! This is my sons first bday album...over 200 pics were taken, lots by children, so there were lots of garbage pictures! Almost no composed shots, candids were wild and messy, but I wanted to incorporate all of the guests and activities, plus we had a special pirate theme I carried from the party through to the album. Yay congrats Chris!!! That is a huge accomplishment!! It's always nice to complete a project. Well I finally got one page done this weekend. I might end up redoing it later- I need to let it sit for a few days and then look at it again and see if I like it then. Drive?? From San Diego to NYC? wow. That's quite a road trip!! How long does that take? I know I have lots of wonderful posts to read. I am very sad & very thankful. Dh just got off the phone with his cardiologist. He said that Dave's heart is too bad to have back surgery. It is long & it would cause him to have heart attack & they would not be able to save him when it did. He would die. I am deeply sad he has to deal with the pain but I am so very thankful to not lose him. The good thing is that the morphine has been working now for a couple weeks & he is able to take care of himself. He can walk without the walker. He is still too sore to do lots of things but he is an avid reader. He loves tv. especially the history channel etc.Our dd has been leaving her tablet when she goes to work so he has been playing with it. I'm so sorry for the news, but thankfully the doctors were truthful and didn't try to do things they shouldn't. I'm glad to hear that he is able to be up and moving around a bit. Now...if your head/eye aches would disappear, that would help your spirits also. I understand how you feel about being sad, but thankful. That's how I felt when they said hubby's prostate cancer was too far advanced to do surgery. They wouldn't even do any more invasive tests because they were afraid of causing more harm. But they did agree to try radiation, although they said he was too far gone...but he's stubborn and God is good. That was back in 1998 (they gave him a year or two at most) and he's the orneriest guy around :>) He still gets a shot every three months, but yeah...it all worked out even though I was really bummed when we kept hearing about these wonderful surgeries, but no one would operate on him. The cancer definitely isn't gone, but it's in remission...it could come back any time since a drug often begins losing it's usefulness after long-term use, but we're so very thankful for what we've been given! Praying it all works out good for you two also. I learned it's not only taking one day at a time...but truly enjoying each day at a time. I understand how you feel. I am not to the point of having to sell my parents house as of yet but the thought of not being able to go home and someone else living there is heartbeaking to me. Stay strong! I am working on a needlepoint cat canvas for my daughter and deciding what to start on with scrapbooking for the weekend. I havent scrapbooked since we moved almost a year ago and I am itching to get started again! Everyone have a good weekend! I am pleased and proud that I did a complete 1 page birthday layout and have everything set up for another layout that I had lost my mojo on a few weeks ago! I have been really wanting to scrap the past few weeks but have just been way too busy. This morning I had a root canal and kept my calendar completely open afterwards due to not knowing how much pain I would be feeling. Since I had the entire afternoon to myself with no commitments, it was wonderful to sit in my scrapbook room for several hours and scrap and create to my hearts content! My wonderful college age daughter even offered to pick up her HS freshman sister for me after school. Now I am hoping after my youngest is in bed tonight, I can complete the 2nd page. My DH is out of town every week for four days so I have the whole night. I hope he can keep improving and working through the pain. Hey guys, I hope to finish the page. I did stamp the journal box. It is cute. I still need to ink everything & adhere. Hi Linda, I'm sorry I haven't had time to catch up, but I saw the bit about the back surgery. I am sending lots of hugs your way... sad and thankful with you. I'm so glad you have some support to help you through this. I wish your realtor would shape up... or maybe someone else can step in? Good luck with the page and the house shopping and let us know if we can help at all! She never answered all her emails but it didn't matter. She told us to use the MLS listing that came in our email because it was the most current. I told her 12 times that the house one never came just condos. Then finally she fixed it like 3 weeks ago. I sent her 14 homes & when we went to see them, she only had 6. She emailed me asking when I was available to see them so that is how we set that up. She keeps saying we need to go daily but I can't get her to go often let alone daily. She never set up the others. I sent her more 6 days ago (Thurs) She emailed me Fri morn asking when I am available. I answered one hour later anytime. I never heard back from her email so I sent one saying I am still waiting 5 days later. She emailed back that she doesn't have internet at home. If we want to see homes, we have to call her on her cell with the MLS numbers. I said it did not matter if she had internet at home. She kept defending herself & blaming us still saying we need to go daily. I sent her a bunch of emails saying that if she wasn't going to answer her emails, do not use it. Do not send out any. She never told us we had to call her cell. I told her it did not matter if she had internent at home. I also said you said we need t o look fast cause they go. When we look tomorrow, it will have been a week that I emailed the houses to her. I said I thought we would go early in the week. They will be gone by the time we see them. She never said sorry for the mix up or sorry you are upset. She just kept defending & saying we should have called her phone. You were the one who emailed me on fri. IF you are not going to answer, don not use email. Every listing & page of the website has her pic & a sign saying email me to see this. It is hard to go daily if I can't get you to go daily . I told her very nicely saying with respect in al l my emails. I might try and find another agent, Linda. She should be a bit more responsive. You are the customer and deserve better. We had similar issues with an agent a few years back and stopped using her. We switched to an entirely different real estate company and were very happy with our new agent. We even recommend her to other people-thats how much we liked her. Hugs Linda. You shouldn't have to work so hard to make HER money. Her reply was I do not make the websites. lol then she sent one saying sorry I did not know you are upset. It shouldnt matter if you're upset or the happiest person on the face of the earth. She shouldn't be snippy or unresponsive or anything other than the most helpful she can be. If she cant schedule a time to take you to see these houses, then she should have someone she works with fill in for her when she can't be there personally. Customer service (or lack of it) is really one of my pet peeves and bad service I have little to no patience for....on a good day!! I would not hesitate to get a new one. We will see how this goes. Good. I hope she shapes up. You have enough on your plate to have to worry about that too. How did your page come out?! I just talked to her & she apologized. I feel good now. We are going tomorrow. I still think she was wrong but we really do not have 1 moment of extra time to switch. I hope we can buy one tomorrow. Wow that is quick!! Tomorrow?! Fingers crossed you find something you love. I haven't had a moment to work on it yet. Since Dave can't have surgery, we have to get a 1 story. Or a 2 story that has a master sweet on the first floor. He can't do stairs. We like several of the homes tomorrow. Linda I hope you find the perfect home tomorrow and I'll be sending positive thoughts your way. IF for some reason tomorrow doesn't work out, I don't think it would take you long to find a new realtor. There are a TON of realtors who would be chomping at the bit to sell a house and make that commission. You are so right. I will see how it goes tomorrow. The funny thing is I kept telling you guys we were looking but we only looked in person once. That is in 3 weeks. Oh well, she said she didn't realize I was upset. You guys are right about the stress. She has always known we were in a hurry. She knew I just lost my brother the prior month. She knew Daves back was bad. Now I have a stress headache. That right there tells me she should have been more attentive. She knows about your situation and she should have made sure that she understood what the expectations were. That's why she gets the commission, because it's HER job, not yours. It sounds like she has been making you do more of the work than you should. But I am happy to hear that you are all the same page now and she knows that you are upset. Hopefully that will solve everything and she'll be better. If not, c ya! Of course, there's a chance that she has also had some things going on her personal life that we aren't aware of, so good for you for giving her a chance to redeem herself tomorrow. I was not mad at her at all. In fact, I did not say anything till this went on for months. I do know she had to take her mom to physical therapy one time. I know she is a busy person so that is why I waited. I am going to work on the page now. I now have everything inked. I now need to adhere everything & jpurnal. OK, I scrapped at work again today!! HAHA! !And got paid for it!! I work at a wonderful state-run museum in upstate New York, in Kingston, called the Senate House. Kingston was the first Capitol of NY in 1777, and the Senate met in a private home, which is now a museum. The house looks almost exactly the same as when it was built in 1676, by Dutch settlers. I give tours, and do some research and transcribing of documents, currently working on letters from 1898! It appeals to the history geek in me! Truly, this is the best job I've had since lifeguarding in college! Today, the site manager assked me to make some signs for an expo he is attending tomorrow, because I am known as the crafty one, so check out my gallery for the Senate House Pics!! One is actually a frame I filled with photos from this summers events as well as previous years. We wear period costumes, and do reenactments and demonstrations of 18th century life and activities. I have good news kinda. We found one this afternoon that just came on the market. Luckily Dave was able to go too for a bit. We put in an offer around dinner time. They countered back & we accepted their counter so in the morning when we sign the papers again, we will be in contract. YEAH but I am not going be excited until we have the inspectors. lol I am not even going to tell you about it yet. I did force myself to finish my heritage page. I haven't had any time to upload it yet. I finished a LO for a challenge and now working on a card. The card will actually work for the challenge and for my card club next month. I finished a LO this afternoon. It was one of those that I just wasn't happy with. I started out happy, but couldn't figure out how to finish it off. I did a few things, but just decided to quit messing with it before I ruined everything I was happy with. I took a picture, but I haven't edited it yet, so I'm not sure I'll get pages uploaded tonight. Thanks guys. WE signed the other offer today. Now we have 4 days till we close on our home. Then we have 9 days till we get our new home if the inspections are ok. WE have 45 days to actually get out of our home. I am so glad. lol Dave is mobile but needs to be very careful so it doesn't get worse. Thankfully the morphine is still working. Dave is deeply sad for my pain of moving. It is breaking his heart. Last night he started having chest pains due to all of the stress. He is a guy who would call 911 right away if he felt them get worse thankfully. I still stayed up watching him just to be sure. He has a heart disease that he had a bypass about 30 yrs ago. I agree with you guys that it will be good after we are done so there is no more stress. Edited by anda11 on 09-22-12 05:17 PM. Reason for edit: No reason given. Thanks hon, I am usually a person who posts positive happy stuff. I am getting tired of posting all the sad or bad stuff that has happened for a few months. Linda~The house news sounds exciting and promising. You guys need a bit of good news! I know you had said how special the house is to you, but it's a house...you and Dave will have your home wherever you end out living. I'm not negating the pain you feel with having to move, but we both have come to realize (the hard way) that there are more important things than houses. They're called "husbands". Has your husband tried cymbalta for the pain? I have a terrible bad back, and it's the only medication that's ever helped me,,,it takes away about 60% of the pain! It's just recently been approved for back pain, so if he hasn't already, he might want to check with the doc and see if he's a good candidate for it! YAYYYYYYYYYYYYYYYYYYYYYYY YYYYYYYYY on the scrappy room and new house!!!!!!!!!! and no, I'm not working on a THING,,,DH and I are going to DISNEY WORLD for FOUR DAYS,,,,,,,ALONE!!!!!! starting TOMORROW!! WOW Holly.. 4 days alone at Disney?? WHOO HOO! I sure hope you guys have fun! I know you will take lots of photos. Linda, Start packin' girl!!! Just a tip, you can find great boxes for house packing at nursing homes, the kind the adult diapers come in. At my honey's job, the boxes are a great size and come with handles punched out already!!! He brings them home for my mom to corral her knitting stash, she needs A LOT. I recently moved and am making an album with pictures of the new house. I printed some pictures last night and took them to work to trim them down. Hi everyone, I just glanced at some of the posts. Judy...you are absolutely correct... he is my home where ever we live. I totally agree with you. He knows that. He knows I am not angry at him because we have to move. In fact..he loves this place as much as I do. He loves the yard, the tress & everything here. He is so sad to leaves our neighbors because he & Dave are best friends & they talk all the time. He doesn't want to leave them either. We have lived here for lots of years our selves. After my Dad died in 94 my mom could not be left alone due to huntingtons, so Dave moved in & stayed here every night until Mom died 2 yrs later. My daughter loved to take care of grandma & she was here almost daily too. I was here daily too. Dave was the only one who could lift mom. WE only lived 2 miles away. He is sad to leave the whole neighborhood too. I have really tried to not think about & work on scrappy stuff so I have acted normal mostly. I think the fact that we are fast approaching a final date.... it really hit me hard. Edited by anda11 on 09-24-12 11:18 AM. Reason for edit: No reason given. THANKS Chris... my daughter is a nurse aid at a nursing home 2 miles away so I will tell her to find them. Edited by anda11 on 09-24-12 11:34 AM. Reason for edit: No reason given. You are right KIm... he is a high stress worry about things kinda person. He has always worried how we are going to move everything to are we going to find a home? to everything else & my stress too. I am sure it is because he is not able to do it himself this time. I need to figure out all the inspection stuff so Dave doesn't have to do it. I will answer more posts later too. GOOD SCRAPPY NEWS......:) :)Dave told me to have some scrappy stress shopping therapy yesterday. I placed an order here. :)I have been wanting to make a page about a telephone operator from the 40s or 50s or 60s. I have a pic of my Dad holding my beloved telephone operator toy in the 60s.I am in the pic too. I also found 2 pics of real telephone operators at their switchboard in the 50s I think. I am going to add those too. I did not even realize they have vintage phone papers out there that are current. October Afternoon has some. one of the pages is called telephone operator.They are perfect. I had to order some papers & journal boxes & stickers with phones. I had to add some beautiful Prima papers that have been in my wishlist for some heritage pages. I always loved purple. lol my van is purple. Edited by anda11 on 09-24-12 12:01 PM. Reason for edit: No reason given. Good for you scrap-shopping therapy!!! It is the PERFECT house for us. :)WE both think so. For some reason. most of the homes I saw needed some kind of construction work. The ones that didn't sold right away. We realized we needed one that didn't need work especially with Dave's back. WE didn't have time for others to work on it & Dave can't anymore. This just went on the market so we knew we had to act fast or lose it. The lady who owned it had redone everything. She had pretty beige siding, She put in a new whole house air conditioner that was small & matched the siding & it was landscaped. She had new windows & doors that are so pretty. One has an oval window. She had put in those stone flower beds around the whole house & along the back fence. She had pretty shrubs & some flowers. I saw some lilys (which I love) There is plenty of space for me to bring my Moms flowers too. I have some of my gr grandpas too. It has a good size back yard with a fence for our dogs. It has a good size covered patio in the back. I can take my porch furniture. We really loved the yard. We really think the house is pretty too. She had a newer roof too. newer furnace & water heater too. Inside was pretty. She put in a pretty brown wood laminate floor throughout the whole house. Many rooms had ceiling fans. She had put in new kitchen cupboards a few yrs ago. She put in a really cool sink that had one of those faucets that you could lift for big pans. She had someone redo the bathroom. IT is done in different shades of beige decorative tiles with cool pattern. The floor had the same tile. beautiful vanity & counter. It was so pretty. We were looking for a little bigger but this is perfect & it is only 925 sq ft. It has everything we needed & wanted. Just checking in from Dunn, NC. It's boring here. Did you take any scrappy stuff? Linda that's so exciting! Thanks for sharing the pics!! So when do you get to move? YAY!! Yep, I did bring a few pictures (ok, maybe about 30-40) and my notes, and one piece of 12x12 cardstock to use kind of as a template. I didn't want to try to bring adhesive or a trimmer or anything because I don't check my bags and I don't think they'd let me carry it on. But I brought pics to hopefully sketch out some ideas. I've just been so tired every night I've gotten nothing done. I also brought a huge pile of receipts to be entered into Quickbooks. I meant to work on that tonight, but took a nap instead. Hopefully I still can. You can't help it if you are too tired. You probably needed your sleep. I hope you can sketch a couple things at least. Have a safe trip. hey guys... I was just playing with my new stuff that came today. YEAH. The telephone stuff was so darn cute & perfect. The Prima papers were absolutely gorgeous. They had been on my wishlist for a long time. I want them for my heritage pages. I also ordered some pics from shutterfly today. I need a couple for this telephone page. Thanks Kim, my dh & I thought it was perfect. Good evening everyone, I hope you are doing ok. I am waiting on my shutterfly order so I can do the operator page. I figured out what I was going to do with the page. I am going to get scrappy stuff ready for craigslist. It is stuff I had been downsizing 6 mos ago. I still have to do more. I am ok with that. All of my stuff is stored in cupboards that go around the room. I will not have any scrappy furniture to take. I did have some of those making memories 2 drawer paper file cupboards but my back has gotten worse & they hurt to pull the drawers out so I took the paper out of them long ago. I will have to get some of those white cubes. I am going to get some drawer ones too. Do any of you have the drawer ones? I tthink I saw they have 4 drawers that are 4 squares. I thought there was thinner drawers too that had 3 or 4 drawers. How tall is the inside part of the drawer ( the ones that are 12 in wide? Edited by anda11 on 09-29-12 03:16 PM. Reason for edit: No reason given. 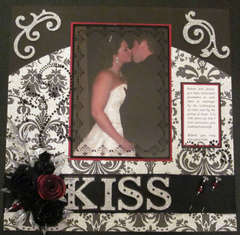 I did one scrapbooking page today. It was a very simple and quick one but I still had fun and like the looks of it. I need more supplies!!!!!! lol I am starting to run low on embellishments and lettering. I forgot to post my heritage challenge page. The photo is hard to see my aunts face so I added the photo. Glad you got a page done! YEAH There is nothing wrong with simple & quick. I do all types. I love simple & quick. I love time consuming ones too. My gallery is a mix of of both. Linda, congrats on the house!!!!! it's so pretty!!!!! Ohh Holly, those are adorable. I do not see how you can say no her. lol They are like making cards... you can't stop making them. lol I know she will love them.